Alumni in Class of 1888 H.S. BY Academy High School Class of 1888. [Anna] Maynetta "Nettie" Bagley received a Diploma: Domestic Science. Source: Deseret Evening News, May 28, 1888. ~ ~ ~ ~ Maynetta "Nettie" Bagley married attorney Samuel Andrew King, also BYA Class of 1888, on September 14, 1892. They had four children: Creighton Grant King; Renan King, married W. D. Johnston; Karl Vernon King, lawyer in Salt Lake City; and Margaret King, married James P. McCency of Washington, D.C.
BY Academy High School Class of 1888. Samuel Cornwall received a Normal Certificate. Source: Deseret Evening News, May 28, 1888. ~ ~ ~ ~ Samuel Augustus Cornwall was born January 18, 1866 in Mill Creek, Salt Lake County, Utah. His parents were Joseph Cornwall and Charlotte Carter. He married at least twice: First, to Mary Bitner Neff on June 21, 1893 in Salt Lake City; and Second, to Mary Jane Helm on August 9, 1939 in Salt Lake City. He died on April 29, 1961 in Mill Creek, Salt Lake County, Utah. Interment, Wasatch Lawn Memorial Park, Salt Lake City. Class of 1888? James Alfred Cragun was born on November 21, 1870, in Smithfield, Cache County, Utah. He died on April 12, 1937, also in Smithfield. He married Katie Blake Halladay on December 24, 1891. She died on August 20, 1969, at age 99. Susan Cragun, a daughter-in-law, says: "James Alfred Cragun was the 5th child and grew up in a large family where the mother was semi-invalid for many years, and he learned responsibility early in life. He attended Brigham Young Academy where he acquired his normal teacher's certificate. He then taught school for twenty years in Cache and Box Elder Counties. He was musically self-taught and played many instruments. He was an extremely kind, sentimental man who loved his family and took much pride in their accomplishments. He died of a heart attack in Smithfield on April 12, 1937, following a slight stroke, and is buried in the Smithfield cemetery." Class of 1888? Frank Milton Driggs. Two years at Brigham Young Academy. Source: Book, The Sons of Brigham, by T. Earl Pardoe, pp. 55-57. ~ ~ ~ ~ Frank Driggs was born on November 20, 1870, in Pleasant Grove, Utah. At an early age he became interested in the problems of hearing, especially deploring deafness, which he was told was hereditary. This he early disproved. He went through grade school with his brothers, did his share of farm work, and passed his home studies as well as his school assignments. He spent two years studying at Brigham Young Academy. He was encouraged by Dr. Maeser and the BYA faculty to become an authority in teaching the deaf. He accordingly got approval from his parents to go to the world's greatest school for teaching the deaf, the Gallaudet College in Washington, D.C., from which he graduated with honors for his Master's Degree. A few years later the College conferred on him an honorary doctorate. He married Maude Elsie Short on January 10, 1898. He served in Utah as Superintendent of the Deaf and Blind School from 1906 to 1945, when he retired. With his wife and daughter, Nell, he moved to California where he gave lectures and wrote articles. He died on February 5, 1959. BY Academy High School Class of 1888, and Collegiate Class of 1896. Jenett Findlay received a Normal Certificate in 1888. Source: Deseret Evening News, May 28, 1888. ~ ~ ~ ~ BY Academy Collegiate Normal Class of 1896. Jenett Findlay of Panaca [not Pauaca], Nevada, received a Bachelor's of Pedagogy degree (B. Pd.). Source: Graduation Program 1896. A second source [note spelling differences]: "Janette Findley" - BY Academy Collegiate Class of 1896. Graduated May 1896 with Bachelor of Pedagogy (B.Pd.). Source 2: Deseret News, May 30, 1896. Source 3: Annual Brigham Young Academy Vol. VI, BYU Special Collections, UA 1008, Box 1, Fd 1. ~ ~ ~ ~ Jenette Ireland Findlay was born on October 9, 1871 [or 1872] in Bountiful, Utah. Her parents were Allen McPherson Findlay and Jessie Ireland Findlay. She married Franklin Spencer, Jr. on October 12, 1901. Franklin was born on March 20, 1872 in Manti, Utah. He died on August 28, 1943 in Salt Lake City, Utah. His interment, Provo City Cemetery. Jennette Spencer died on October 4, 1913 in Provo, Utah. Her interment, Provo, Utah. BY Academy Class of 1888. John Foote received a Diploma: Rhetoric, Physics, General Chemistry. He also received a Normal Certificate. Source: Deseret Evening News, May 28, 1888. ~ ~ Faculty & Staff. John Foote, Training School, 1881-1884. Class of 1888? Matilda Hales (or Aunt Till as she was known by her many nieces and nephews and eventually by everyone in the area) was the eighth of fifteen children of Henry William Hales and his plural wife Sarah Jane McKinney. Matilda also had nine half brothers and sisters, children of Henry and his first wife Eliza Ann Ewing. Matilda was born on March 11, 1870, in Enterprise, Weber County, Utah, where her father was a county commissioner. The family lived in Enterprise until the high waters of the Weber River cut their farm in half and carried about ten acres of the best land away. Henry moved his family to Cedar Valley, West of Utah Lake, and then to Laketown, Millard County, where, according to his journal, the family "entered and fenced a quarter section of land and farmed and raised stock and sheep till 1891 when we moved to Deseret. As the presiding elder in Laketown, Henry arranged for his children and other children in this very small community to receive some basic schooling. The family lived frugally, worked hard, and prospered after their move to Deseret, and Henry became a prominent figure in the community and in the local LDS church. Their home was relatively modest from the outside but was furnished, according to granddaughter Mable Crafts Peterson, "with elegant furniture for the period ... silverware ... from England ... a beautiful pump organ ... a wonderful library and many of the books were first editions." During local church conferences visiting General Authorities from Salt Lake City often stayed in the Hales home, an event that required days of cooking and other preparation and gave the family great satisfaction and pleasure. Not much else is known about Matilda's girlhood except that she was required to work very hard to help provide for the needs of a large family in an isolated rural community. Later she attended Brigham Young Academy and received the training necessary for a certificate that qualified her to teach "pedagogics, reading, writing, English grammar, United States history, Physiology and Hygiene, written arithmetic, drawing, geography, spelling, nature study." Her brief teaching career included a short stay in Big Wash, Nevada. As a young woman Matilda had at least one proposal of marriage but did not avail herself of the opportunity. In later years she would stand with her hands behind her, rock back and forth with a big smile on her face and a twinkle in her eye, and remind other members of the family that she had had a chance to marry but was a spinster by choice. Matilda also had a quick wit. One time John Henry Western asked her in jest, "Matilda, if you had a chance to marry N. S. Petersen or me, which one would you marry?" She said, "I would marry N. S. Petersen, he's older and would probably die sooner." She spent her life in the service of others, as a midwife, nurse, foster mother, and care giver, serving the people of Deseret, Utah. Matilda died peacefully on October 29, 1957, at her home in Deseret, Utah, at the age of eighty-seven. She had been the last surviving child of Henry and Sarah Jane's fifteen children. In the closing lines of his eulogy, Eldon Eliason, who had been a beneficiary of Matilda's service over the years, summed up her life's achievement in these words: "And long after monuments have crumbled into dust and been forgotten, her influence for good and her effect upon the community shall live on, and where mercy, love and service are needed, that influence will live with us and the same feeling prevail as when we said, "There goes Matilda." BY Academy High School Class of 1888. Alexander Hedquist, Jr. He received a Diploma: Bookkeeping. Source: Deseret Evening News, May 28, 1888. Alexander Hedquist, Jr. was born on August 9, 1873 in Salt Lake City, Utah. The Hedquist family moved to Provo in 1885 in order to improve their opportunities for education, and so Alex Sr. could establish his shoe shop. Young Alex met Principal George H. Brimhall in the Provo Schools, where spelling was highly developed. In a popular spelling bee, Alex won a certificate as one of the two best spellers in the district. President Brimhall introduced young Alex to Professor Karl G. Maeser, and Alex attended Brigham Young Academy for three years. He obtained a certificate in the Commercial Department in 1888. Drug Store Manager, Druggist, Banker, Civic and Government leader. First married Lavina Strong of Provo on January 8, 1897. She died in 1908. Second married Vivian Finlayson of Provo on January 2, 1916. She died on September 17, 1962. BY Academy High School Class of 1888. Samuel A. King. He received a Diploma: Domestic Science. Source: Deseret Evening News, May 28, 1888. Samuel Andrew King, Criminal Lawyer in Salt Lake City. Born January 9, 1868 in Fillmore, Utah, Samuel A. King, affectionately known as "Sam" possessed the talk and wit of his Irish ancestry. He came to BY Academy in his teens and felt the influence of Karl G. Maeser and his devoted faculty. Nearly four years younger than his brother, William H. King, he emulated William's leadership by enrolling in the Acadmey and completing his courses in 1888. As his interests turned to law he attended the University of Utah for one year. In 1890 he was called on a mission to Ireland, the ancestral home of his grandmother Creighton and the mission field of his father, William King. He served with distinction for nearly three years at a time when Home Rule discussions were at their height. Advanced schooling took him to the University of Michigan where he received his LLB in 1893. He had married beautiful Maynetta Bagley, a BYA student, in September of 1892. After her death, he married LaRen Watson of St. George, Utah, on September 22, 1929. He opened a law office in Provo in 1893, becoming a member of the firm King and King, brothers in legal pursuits, and was elected County Attorney in Utah County, 1896-1898. He also served as Provo City Attorney and Prosecuting Attorney for the 4th Judicial District, 1898-1900. It was in these later offices that he decided to devote most of his practice to criminal law, as he enjoyed talking to juries, winning his points when victory was often most problematical. Sam moved to Salt Lake City for the major years of his legal life, being a partner for the most part with his talented brother, William H. King. The Salt Lake Tribune in the issue of August 28, 1943, in an obituary records: "Mr. King probably defended more persons charged with murder than any other lawyer in the nation. None of his murder clients was ever executed, although some were sentenced to prison terms. Most of these, however, were subsequently pardoned." Among his many celebrated clients were Jack Dempsey, Marie Dressler and Charles Chaplin. He died at seventy-five while on a visit to Salt Lake, on August 27, 1943. BY Academy High School Class of 1888. Agnes Lewis received a Diploma: Domestic Science. Source: Deseret Evening News, May 28, 1888. BY Academy High School Class of 1888. John G. Lind received a Diploma: Bookkeeping, Physiology & Hygiene, General Chemistry. Source: Deseret Evening News, May 28, 1888. BY Academy High School Class of 1888. Joseph McGregor received a Diploma: Bookkeeping, Physiology and Hygiene. Source: Deseret Evening News, May 28, 1888. BY Academy High School Class of 1888. [Rhoda] Celestia Nash received a Diploma: Rhetoric, Domestic Science. She also received a Normal Certificate. Source: Deseret Evening News, May 28, 1888. ~ ~ ~ ~ Rhoda Celestia Nash was born on February 17, 1866 in Alpine, Utah County, Utah. Her parents were Ephraim Nash and Rhoda Young McNicole Nash. Celestia Nash married Henry William Rowlands. She died on August 19, 1949. Her death certificate. BY Academy High School Class of 1888. Mattie Nelson received a Normal Certificate. Source: Deseret Evening News, May 28, 1888. BY Academy High School Class of 1888. Axel Nielson received a Diploma: Physiology & Hygiene. Source: Deseret Evening News, May 28, 1888. BY Academy High School Class of 1888. James Rawlings received a Diploma: Physiology & Hygiene. Source: Deseret Evening News, May 28, 1888. BY Academy High School Class of 1888. Nephi Savage received a Normal Certificate. Source: Deseret Evening News, May 28, 1888. BY Academy High School Class of 1888, 1889, and Collegiate Class of 1900. John Swenson (Swensen) received a Diploma: Physiology & Hygiene, Rhetoric. Source: Deseret Evening News, May 28, 1888. 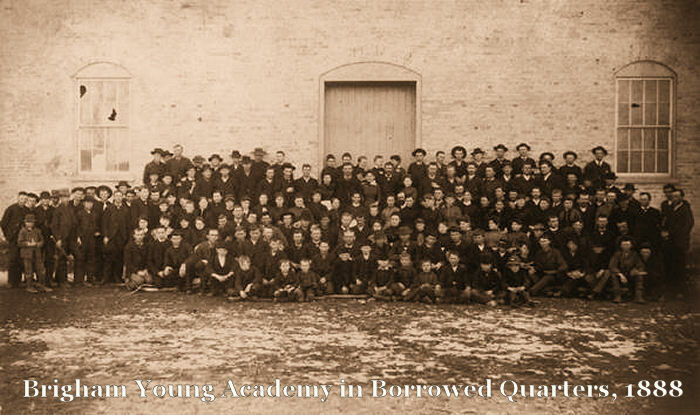 ~ ~ ~ ~ BY Academy High School Class of 1889. John Swenson (sic) received a Certificate in Rhetoric. Source: Utah Enquirer, May 28, 1889. ~ ~ ~ ~ BY Academy Collegiate Class of 1900. J. C. Swensen received a Diploma: Bachelor of Didactics (B. D.). Source: Deseret Evening News, June 2, 1900. ~ ~ ~ ~ Faculty & Staff. John C. Swensen, Economics & Sociology teacher, 1898-1941. ~ ~ ~ ~ John Canute Swensen was born February 4, 1869 in Pleasant Grove, Utah. His parents: Knud (Canute) Svendsen and Johanne Maire Pedersen. John C. Swensen married Margaret Ellen Davies (Davies in Wales, Davis in America) on June 21, 1899 in Salt Lake City, Utah. They had ten children, all of whom attended Brigham Young High School. He died on August 30, 1953 in Provo, Utah. Interment, Provo City Cemetery. ~ ~ ~ ~ John originally used the -SON spelling, but later in life he decided it would be better to use the -SEN spelling. John and Margaret had ten children; five of the children continued with the -SON spelling, but the other five changed and used the -SEN spelling. They had seven sons and three daughters as follows: ~ ~ 1. John Starr Swenson [BYH Class of 1917? ], born March 27, 1900, died December 28, 1977. He married Marva Carter. ~ ~ 2. Carl Davis Swenson [BYH Class of 1919? ], born August 3, 1901, died April 29, 1979. He married Lura Tanner. ~ ~ 3. Reed Knute Swenson [BYH Class of 1921], born February 16, 1903, died April 2, 1989. He married Ruth Freebairn. ~ ~ 4. Alice Swenson, born May 10, 1905, died in infancy. 5. Margaret Swensen [BYH Class of 1923], born May 29, 1906, died January 30, 1987. She married James L. Jacobs. ~ ~ 6. Francis McLean Swenson (Mac) [BYH Class of 1926? ], born June 29, 1908, died August 22, 1963. He married Willa Sowards. ~ ~ 7. Louise Swensen [BYH Class of 1928? ], born May 24, 1910, died October 5, 1992. She married Jay Tolman. ~ ~ 8. Joseph Cadwallader Swensen [BYH Class of 1931], born June 15, 1913, died May 9, 2005. He married Verna Harding. ~ ~ 9. Albert Donald Swensen [BYH Class of 1933], born May 28, 1915, died October 6, 2001. He married Jennie Romney. ~ ~ 10. Richard Davis Swensen [BYH Class of 1936], born July 7, 1919. He married Arleen Stowell. ~ ~ ~ ~ His parents were: Father: Knud (Canute) Svendsen, born April 11, 1827 in Veibye, Hjorring, Denmark, died on March 14, 1902 in Pleasant Grove, Utah. Mother: Johanne Maire Pedersen, born September 13, 1833 in Sevenolstrup, Viborg, Denmark, died on May 7, 1880 in Pleasant Grove, Utah. They married on June 24, 1860 in Pleasant Grove, Utah. They had eight children: ~ ~ 1. Annie Swensen, born April 8, 1861 in Pleasant Grove, died February 21, 1920 in Pleasant Grove. ~ ~ 2. Marie Swensen, born November 8, 1863 in Pleasant Grove, died on November 18, 1865 in Pleasant Grove. ~ ~ 3. Swen Larsen Swensen, born February 17, 1865 in Pleasant Grove, died June 12, 1936 in Oakland, California. Interment, Pleasant Grove. ~ ~ 4. Mary Mette Swensen [BYA Collegiate Diploma 1891], born January 14, 1867 in Pleasant Grove, died April 2, 1959 in Monticello, Utah. Interment, Ogden, Utah. ~ ~ 5. John Canute Swensen [BYA High School 1888; BYA Collegiate Diploma 1900], born February 4, 1869 in Pleasant Grove, died August 30, 1953 in Provo, Utah. ~ ~ 6. Eliza Johanne Swensen [BYA Collegiate Diploma 1891], born July 7, 1871 in Pleasant Grove, died September 17, 1931. ~ ~ 7. Hanson P. Swensen, born October 1, 1873 in Pleasant Grove, died as an infant on October 5, 1873 in Pleasant Grove. ~ ~ 8. Caroline Christine Swensen, born November 8, 1874 in Pleasant Grove, died as an infant on December 3, 1874 in Pleasant Grove. BY Academy High School Class of 1888 and 1889. Caleb Tanner received a Diploma: Bookkeeping and General Chemistry. Source: Deseret Evening News, May 28, 1888. BY Academy Class of 1889. Caleb Tanner received Certificates: Physics, Algebra, Geometry. Source: Utah Enquirer, May 28, 1889. Faculty & Staff. Caleb Tanner, Geometry & Engineering, 1897-1904.